Marina Bay Sands SkyPark truly gives a taste of the extravagant lifestyle as one views Singapore from elevation. There is a big wooden decked area high above the iconic Marina Bay Sands hotel at the edge of the city’s harbor offering a 360-degree panoramic views, just nothing but a sheet of glass and a number of wires between you and the amazing view. Have you ever dreamt of sitting on the top of the World? Singapore turns your dream into reality at Marina Bay Sands SkyPak. While you sit on top of the enormous, three-angled hotel overlooking the bay, Marina Bay Sands SkyPark has been one of the most famous attractions in Singapore since it has been opened. 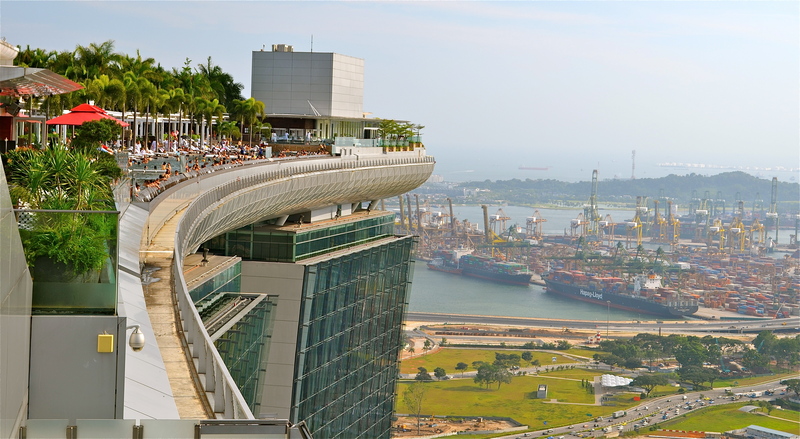 Keep reading to known more on Marina Bay Sands SkyPark and Observation Deck in Singapore. Travelling to Singapore is always easy, thanks to buses plying from most location. So, just buy bus tickets and explore this alluring attraction in Singapore with your loved ones. If you manage to make it to an early evening you shall catch a better sunset sight and click a few good shots as the place starts filling up as dusk proceeds. You can see Singapore by both day and night, both are impeccable in their own ways. 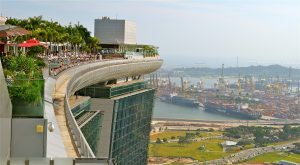 Once you arrive in Singapore getting to Marina Bay Sands SkyPark is quite simple, just that you may take the MRT, the closest stop is Bayfront, and from here you can walk via the luxury mall directly into the hotel’s gigantic lobby. Once you head to the registration desk located in the bottom of tower three, there is a separate lift that shall take you to the 56th floor and the outdoor viewing space. The observation deck occupies one side of the rooftop region of Marina Bay Sands, up on the top, the city and the docks including an impressive view of Gardens by the Bay, Singapore’s futuristic park and the amazing metal tree structures are just mesmerising. The most favourable time to come up to the SkyPark is early evening, and as suggested if you are lucky perhaps even a sunset view. You can take up guided tours of the SkyPark, which takes place on every day basis. Apart from just gazing at the city you can get a much deeper insight into all the amazing sights, as well as a listen to a deep history of Singapore. You also get a chance to see the pool area, which is usually reserved for guests only. Each tour can only take a limited number of people around and registration starts at 09:30 on a first-come-first-served basis. Don’t stress yourself for the guided tour too much, as there are more if you don’t manage a tour, there is enough to look at; be sure to take your camera so you can take click many shots. These are such photographs that will make everyone at home feel jealous. This shall not be the only highest view that you can get of the city, but sitting atop of such a famous hotel with the double view of the skyscrapers is well worthy way to wrap up your trip. Having read this I thought it was rather informative. I appreciate you spending some time and energy to put this content together. I once again find myself spending a significant amount of time both reading and commenting. But so what, it was still worth it! Hi there, You’ve done an excellent job. I’ll certainly digg it and personally suggest to my friends. I’m sure they’ll be benefited from this web site.